Yup I am ……Why? Because every day is getting closer to the new Harry Potter movie……………waaaaaaaa I can’t breathe I am so excited about it….. which is why I managed to buy too many tickets for it on fandango today. It was entirely my fault, I got the email saying the tickets were now available in my area so I booked 2 for 10pm wednesday……then I thought…. hang on I wonder if there is a midnight show on Tuesday/Wednesday morning and sure enough there was …………ooooooops. So of course I have to see it as soon as it’s out so I guess we will see it 2 days in a row yaaaaaaaaay……. I mean dang. And I have brilliant seats to see it at the imax theatre in Chicago on the 15th very back row score. It has to be better than when we saw goblet of fire on the imax in DC’s air and space museum and were very front row, good god that hurt my neck 2hours of looking up hurts. Anyway yes I am Harry Potter obssessed so I can’t wait……. It seemed like I hadn’t needle felted for ages, and to be honest I think because I had made so many critters for the lovli craft fair in such a short time I was a bit hesitant to make another one for a while. But I couldn’t keep away from the roving for long. Meet Barnaby T. Bunny……..What do you think? I am really pleased with how he turned out, I think he’s my most cartoony critter to date. I love his dopey goofy expression to bits. He’s a big boy as well, bigger than all my other critters. I think my time off needle felting made me crazy with my wool supply. well if they like it that is……..
I’m loving making the mobiles…….so I thought why not try and do one for the artomat. What do you think? Oh I hope they like it. All the goodies laid out. And when you put them together you get…..
taaaadaaah. Your own little tabletop mobile. I had the funniest week this week. I listed my Super Mario stabby on ebay last Sunday and looked what happened….. Still the publicity was nice, and my husband was very impressed (apparently Kotaku gets used on gizmodo all the time) so in his eyes I think it’s like turning water into wine or something………. With my etsy store. I am serious, I find myself constantly thinking of things to put in there just to make it look cool……I am not even thinking about wether or not it sells (really, I swear). I think it’s because earlier this week a lovely etsian named Onama http://www.etsy.com/shop.php?user_id=54355 very sweetly made me a banner. I think she felt sorry for me and my pathetic effort for a banner…..but anyway I love it, have you seen it yet? shame on you if you haven’t quick take a peek I’ll wait here…..
http://www.etsy.com/shop.php?user_id=5096861. So what do you think? Well as I said I love it and it has become a goal to get as many people to see it as possible, which of course means lots of cool stuff for the store. So on that note what do you think of my mobiles? The chickens are made from felt and are all hand stitched………gawd I need a sewing machine, they took ages to make. The little eggs are of course needle felted from Corridale wool roving. They look pretty sweet. I also put my mice to good use.. So I am loving my mobiles. And can’t wait to put them in the store. On another happy note, I heard from Took Gallagher via email. Took owns a gallery in the Detroit area called the Dancing Eye Gallery, and was letting me know she had received some of my stabby critters for her art-o-mat machine. Now this is unbelievably cool for 2 reasons……..number one being Took is the only art-o-mat artist that I have ever bought 2 boxes of from the Madison machine…….I love her Juniors they are so cool. And number 2 ……Detroit area yaaaaay My critters are travelling further than I thought they would. Yaaaaay it’s gonna be a critter invassion. If you have a myspace page I’d add her as friend. I of course don’t have a myspace page as I find myspace scary and creepy. And I also don’t like it’s connection to Rupert Murdoch and Fox, but then that’s just me. So I finally downloaded my camera worth of piccies and can show you my little table at the lovli fair. I got really lucky with my placement, I snagged the corner so could commander all the window space for my pillows and kits. I had made a felt banner saying stabbies that I swagged above my table…..and I was really happy with how it looked. So I had a great time at the fair and loved the two women I was placed beside. The rather raunchy gothfox http://lov.li/users/gothfoxdesigns who makes pasties……they were awesome and fun. And noxenlux http://lov.li/users/Noxenlux her hats were gorgeous and she even made some while at the show. I love to see people making stuff at craft shows, it makes it so much more personal when you can see how much work goes into the craft. So I am readjusting to being back in Rockford after Portland. So unfair…….I wish I had a million dollars, I am pretty sure Portland would be my top pic of where I’d want to live……Portlanders (if that’s what you call yourself) please know I am so utterly jealous of you I could spit…….and I hate spitting. But boy do I wish I wasn’t. Portland was utterlly fantastic, what a place……tons going on, fantastic friendly people, great neighbourhoods. The overall atmosphere there was so great it made me want to move instantly. The Lovli fair was a lot of fun too. I met tons of very cool people, and people genuinely seemed to like my critters. 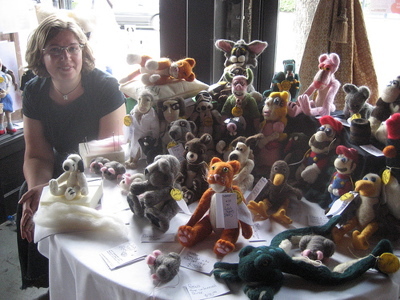 I realised that I do enjoy being in craft fairs, and talking about what I do. The wonderful Diane Gilleland of the church of craft and DIY workshop was one of the organisers of the lovli fair. She has a really cool blog all about crafting at http://craftypod.com and my critters get a mention, which is thrilling. I also am the featured artist at http://qbranchltd.blogspot.com. So all in all it’s been a fantastic week. I’m exhausted now though, and feel like I could sleep for a week. I’ll post piccies of the trip soon. You are currently browsing the Stabby Critters weblog archives for June, 2007.